Last year at Tokyo Auto Salon, Lexus had a pretty large booth that mimicked some kind of Nordic dance club bar one might see in Oslo or Stockholm, all white and glass and steel, with flashing lights, dancers, and Lexus staffers in thin, crisp reflective suits. This year? Carbon fiber race cars. That’s it. I’m not complaining. That’s a lot of damn carbon fiber. 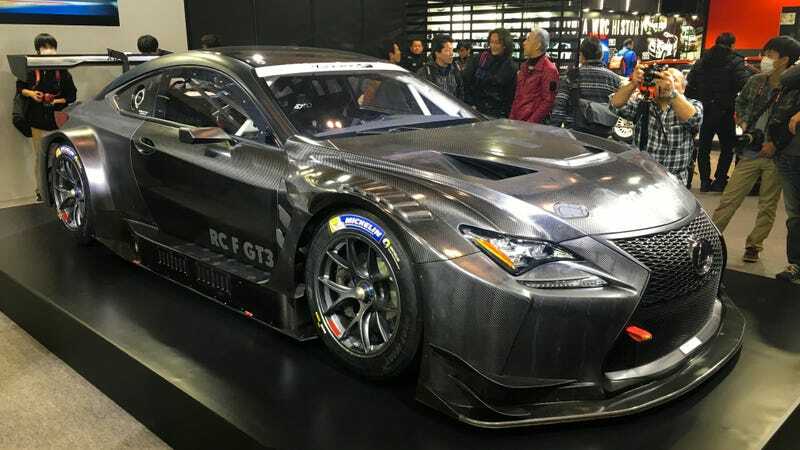 Lexus’s contributions this year were the SUPER GT LC500 and the RCF GT 3. Not exactly things you can swing by your local dealer and pick up. While both were quite incredible, they didn’t give much of an indication as to what Lexus’s line-up is or would be, and wouldn’t be very helpful in making a purchasing decision. But they sure were pretty.